Mary Ellen Grinolds of Harrington, went Home to be with the Lord, on Thursday, November 22, 2018, from her home, she was 81. She was born in Harrington to the late, Mary Elizabeth and Leslie A. Simpson Sr.
Mary Ellen was a graduate of Harrington High School Class of 1955. She went to work at Playtex from 1955 to 1956. In the same year, she married her husband, Larry M. who was from North Dakota. The following year in 1957, they had a son born named Rickey. Mary Ellen decided to go to beauty school, and in 1963, graduated from the Best Beauty School. She then owned and operated The Beauty Spot salon in Harrington until 1969. In 1968, she moved with her family to Millsboro, and in 1969, she went to work for the Delaware Motor Vehicle, until 1974 when she transferred to the Division of Social Services. She also operated her Beauty Shop out of her home at the same time. Mary Ellen retired in 2005 as a Senior Social Worker, and in 2013, returned to her home town of Harrington. Mary Ellen liked to travel, sing karaoke, go to the casino, eating out, and spending time with her family. 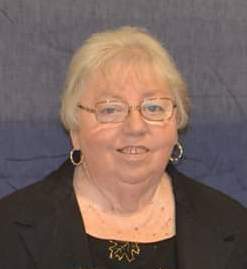 Mary Ellen was a member of the Harrington Senior Center, Harrington Moose, American Legion Post 7, Possum Point Players, Harrington High Alumni - where she served as President in 1999 and 4 years as secretary of the executive committee. She was also a member of the Pocahontas Anona Council 11 - where she received Pocahontas of the year award in 2013, she also served on the Great Pocahontas of Delaware 2012-2013, member of the Cheerful Notes Glee Club since 1999, and a member of the Prospect Church of Harrington where she sung in the choir. In addition to her parents, she is preceded in death by her husband, Larry Grinolds; son, Rickey A. Grinolds; brothers, Leslie A. Simpson Jr., Charles Irvin Simpson, Robert Allen Simpson; sister, Grace U. Simpson. She is survived by her brother, Paul (Beulah Mae) Simpson; grand daughter, Joy Marie Price; grand son, William L. Grinolds; 13 great grandchildren, 2 great great grandchildren, and a host of nieces and nephews whom she loved dearly, and who loved her dearly as well. Funeral services will take place at the Melvin Funeral Home, 15522 South Dupont Hwy., Harrington, on Monday, November 26, 2018, at 1PM, with a visitation for family and friends starting at 11AM. Interment will take place at the Delaware Veterans Cemetery, Millsboro at a later date.